Dead of Winter, by Plaid Hat Games, remains at the top of my want to play more list. What tends to keep it from being on the game table more often though, is the set up time. A lot of my game nights are prefaced by a mad dash to pick up kids and get work and family objectives complete before the Gwarkonians arrive to partake in gaming; a mini worker placement game of its own. 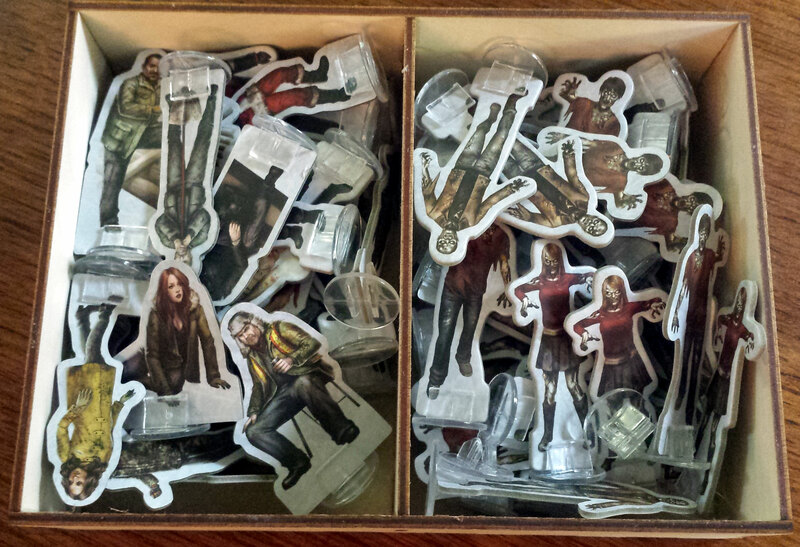 Unless I am able to set up Dead of Winter the night before, or it’s a weekend, it is likely to go back on the shelf. 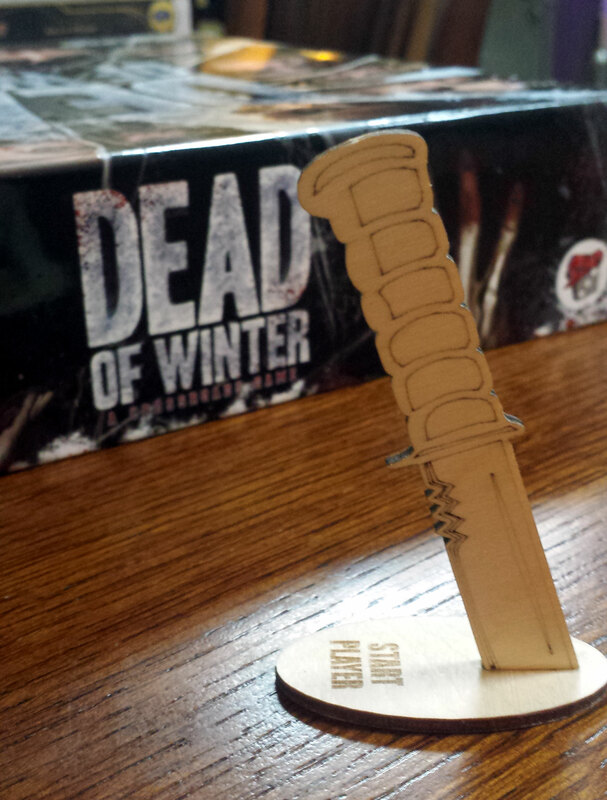 It’s a shame too, because Dead of Winter is a fantastically good time. I started there to bring you here. On an outing to my local game store, I found out they had an end cap of The Broken Token products. 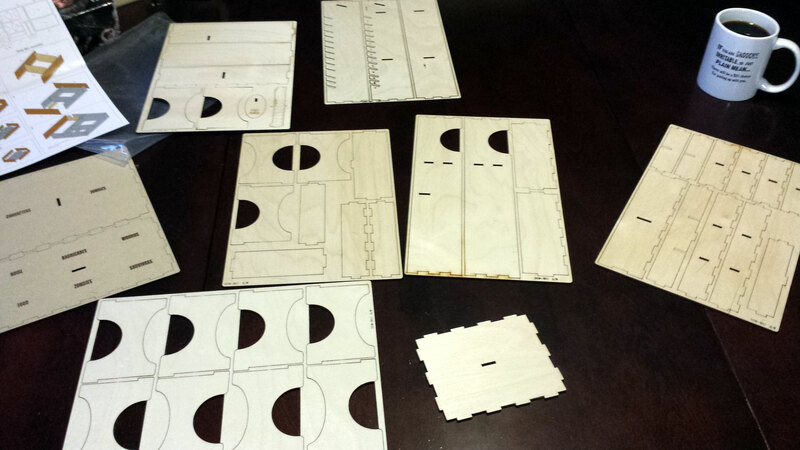 The Broken Token is a company that offers 1/8″ wood, laser cut board game box organizers, among other board game accessories. I previously purchased their organizer for King of Tokyo and was pretty impressed with how thought out it was. Immediately, my gaze zeroed in on the Dead of Winter organizer. It didn’t have me at hello, though. At just under $30, or the cost of another game, I took pause and shelved the idea. A couple of weeks later, I was back at the store with my daughter on Table Top Day and in the spirit of the made up holiday, decided I should take it home. Was it worth it? Instructions: Read the instructions! This is a no-brainer for me, but I am super nerdy about reading manuals and rule books (I actually enjoy it, much to the amusement of my friends and family). While the instruction pamphlet is predominately illustrations, it is in color and well-organized, which I think is a nice feature and I think a lot of companies would skimp on. You definitely will want to get a feel for how the organizer goes together. Also, don’t remove pieces until they are needed. A lot of the pieces look the same and you could easily place a similar looking piece in the wrong section. 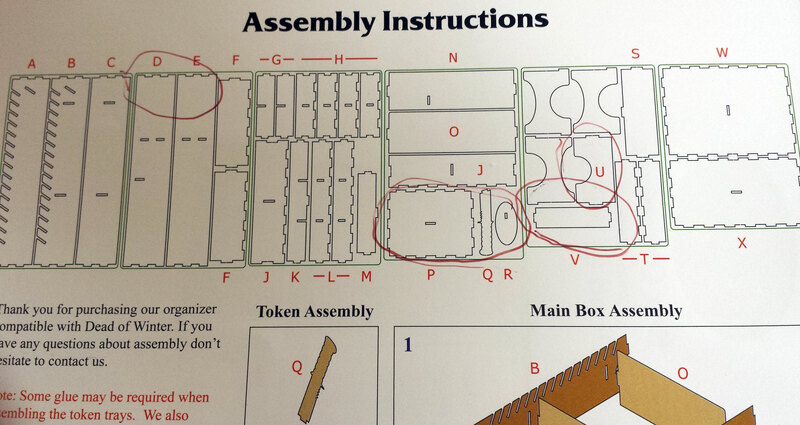 There is a helpful “Assembly Tips and Tricks” section on the back that is a must for first time builders. 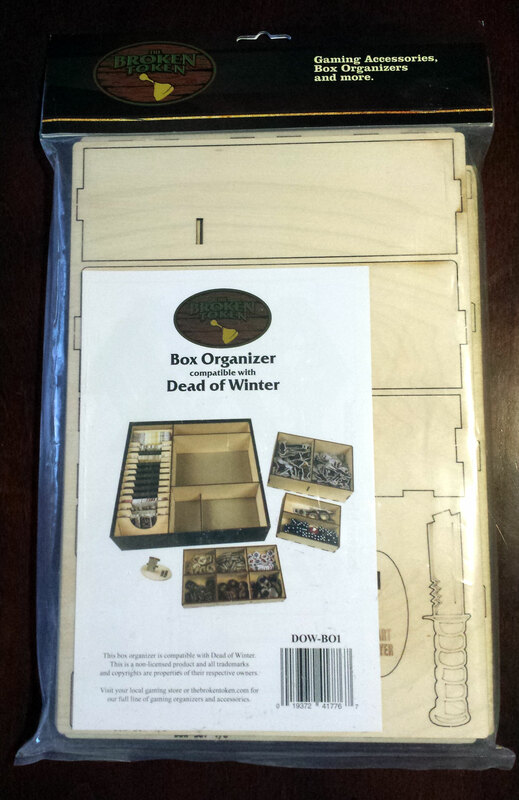 This wasn’t my first organizer rodeo, I had some experience with the preparation and build from King of Tokyo, but if you don’t – or just want some more information – The Broken Token also offers a handy Assembly Guide section on their website. DANGER WILL ROBINSON! The circles are where the illustrations didn’t match my boards. It is very easy to work around, but could (zombie) bite you if you are not careful. Assembly: I have built things since I was in short pants and love doing it. Countless models, landscaped yards with rock walls, HO train scenery, dungeons with Hirst Arts Molds, so on and so forth. That said, I am still quite prone to over-engineering and miscalculation. These are general faults of mine that I have learned to work around. Given those tendencies, I always have been a bit wary of wood based kits. The wood is usually thin and tends to split and crack, or even break if you force it too hard (fault number three for me). These organizers are made with birch and do not suffer from the same fate. This is my second Broken Token organizer and I continue to be impressed with how sturdy the pieces are and the precision with which they are cut. The pieces are removed from the boards with no hassle and the build prep is minimal. While you can sand the edges if you wish, I only use a hobby knife to trim the little knobby that connects the piece to the board. If you are grouchy or mean, it’s a $10 charge (it says so on the mug). That likely won’t happen if you are putting this insert together. Some pieces are a pretty tight fit and this feels like it is by design. That said, and in reference to my third build related character fault, don’t force it. This is where sandpaper might prove useful, but usually the gentle influence of a rubber mallet or just steady pressure with your hands will pop everything into place. While I add a touch of wood glue to all the main build areas, the tight fit ensures everything will stay together. The pieces are laser cut and the quality and fit of the build is superb. Pieces go together exactly as they should, making the build process enjoyable and fairly quick. It was 45-60 minutes from soup to nuts, working at a leisurely pace. Organization: As mentioned before, I am fairly prone to over organizing and engineering things. This bleeds into my game organization as well. I have been known from time to time, to actually increase the set up time of a game due to countless baggies for every individual chit group in a game. On top of that, I have a stack of plastic cups that I like to put chits in for game play. So in process, you have to dump the bags into the cups. If there are a multitude of different chits (I am looking at you Fantasy Flight), I could have more cups on the table than a beer pong tournament (Is that still a thing?). It could be argued that Dead of Winter was one of those examples. When I first laid eyes on this insert, the pictures of a well structured organizational system for all the pieces was really intriguing, but dubious. Could it really replace all those bags? Yes. Yes, it can. Not only does it put a multitude of bags back in my reserve, but all you have to do is pull the inserts out, set them on the table and BAM, you’re killing zombies and undermining your friends goals. There is a tray that holds the zombies and characters, a tray for the dice and assorted chit pieces, and the last one to hold the six other categories of chits. The insert also has slots for every type of card in the game, so they are already sorted and ready to shuffle and place. I read some feedback online that complained about how the cards sit in the slots, but mine fit great and it seems, though I haven’t sleeved mine, that there is enough room to sleeve them if you wish. No worries about zombies falling over into the other side, no matter how much they look like they want to. I was most impressed with two items. The first is the tray for the zombies/characters. I don’t take the plastic stand off my standees every game as they are a tight fit and I worry about them ruining the cardboard after several sessions (not a huge complaint as they also don’t slip off, which is a bigger issue for me). For this reason, it was three baggies stuffed with zombies and characters. I figured the picture on the instructions was a carefully organized rue, like those of a tent being disassembled and actually rolled back into the carrying case. I was completely wrong. All figures fit comfortably in the tray and the characters no longer have to worry about zombie intermingling between games. Second is the first player token. Absolutely not necessary for organization, but amazingly cool. Mine is already in my queue to be painted. Well played, Broken Token. Well played. 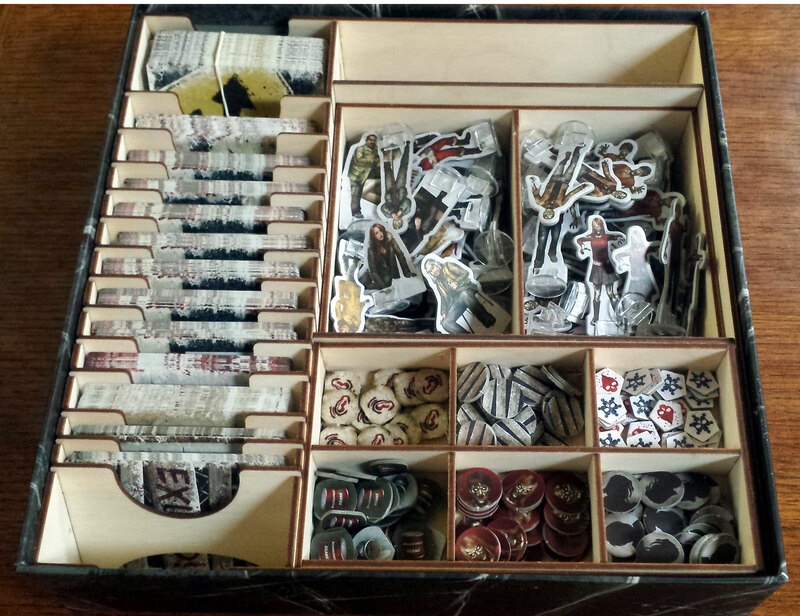 Once assembled, the organizer fits very well into the game box. The instructions recommend a piece of tape on the corners and I think that is a good idea. My King of Tokyo organizer fit a bit too snug, creating a very slight bulge, but this was a perfect fit. Remove three trays, pull the cards, and you are ready to play. It doesn’t get much more efficient than that. Final Thoughts: Prior to the buy, the Monday Gwarkonians discussed this product and whether it was worth buying or not. The argument was, not matter how cool the organizer is, would it be worth the cost of another game. No real decision came to light, but it was something that stayed in my mind through the purchase of this product. It was a bit difficult to pay again a good chunk of what the game cost for an accessory. One could argue that game companies should spend more time thinking about the game organizer in the first place. They could always look at Lords of Waterdeep to see exactly how it should be done (you may hate the box, but the insert is exceptional). I also acknowledge that it would increase the cost of the game, so it becomes a bit of a hypothetical wash. Regardless, this organizer is worth every penny spent. I haven’t been able to get the game on the table since I built the organizer, that owes more to my lack of gaming due to the extraordinary pace of Spring activities, but I have absolute confidence that I can cut the set up and take down time by 70% percent. The Broken Token organizer could be the driving factor in being able to pull Dead of Winter off of my “Want to Play” and onto my “Top Games Played” list. At the end of the day, if this organizer saves enough set up time that I can play an incredible game more often, then investing the money on the organizer, instead of something new, is an easy decision. Lift, place, roll well and groove on. 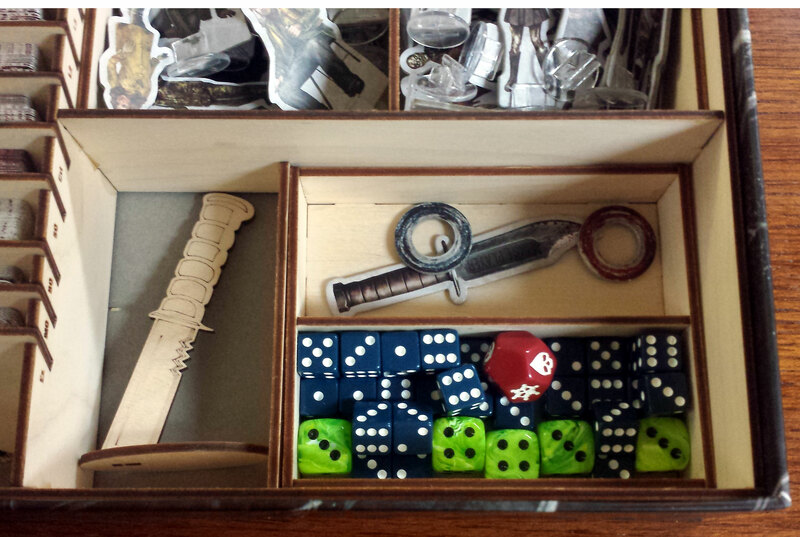 Nothing to see here but a couple knives and some cool looking dice, fit all nice and snug in the box.